Bryce Canyon National Park is famed for its numerous stone columns, called hoodoos. Less well known is that Bryce Canyon produces many phantom images, apparently the result of light and shadows. Those phantom images are not permanent. If you find one, you probably will never see it again in your later visits. Some phantom images just disappears by changing the viewing angle, but some are more durable. 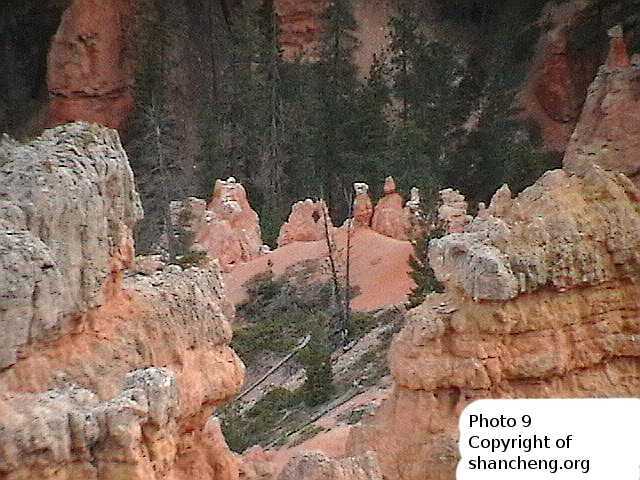 The place within Bryce Canyon that produces more fantastic phantom images is called “Fairy Land”. It is a much smaller area than the main amphitheater, and hoodoos there are much less orderly than the ones in the main amphitheater. The main amphitheater, though still produce some phantom images, their number is far fewer and the qualities inferior than the ones from Fairy Land. The pictures of phantom images listed here are all taken from the still picture mode of a palm camcorder made by Panasonic (SDR-S7p). This camcorder is a Standard Definition machine, so its still picture mode has a resolution of 640 x 480 pixels. The camcorder has a lens with 10x zoom range. The pictures are only “sharpened” by the open source photo editing software GIMPS, and nothing else have been done on them. 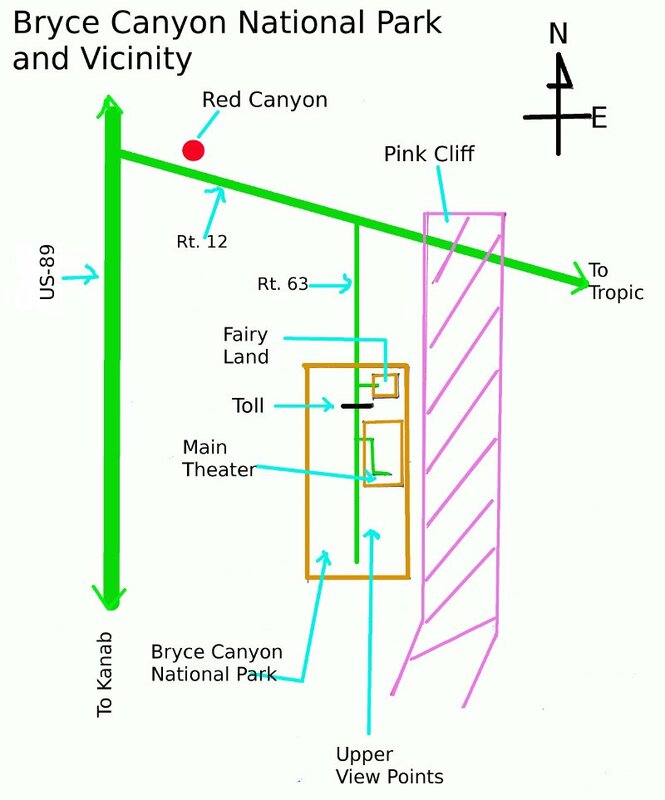 A map to show the location of "Fairy Land"
and the main amphitheater of Bryce Canyon. In this picture there are numerous phantom images. At positions, A1, A2, and A3 there are three stones respectively. that moment. That is an example of a "phantom image" created at "Fairy Land". "Pumpkin Head", and at the position Dd, a face with two big eyes popping out. may claim to see a shape of a Poodle. This picture was taken from a slightly different angle from Picture 1.
toward the left of Ab. man with white hair, white bear and something on his head, is sitting on a chair. whitish face lying near the foot of the left column. at varying positions in the frame, but are not shown here. ballerina, but instead many other phantom images have been found as reported here. the camera was directly facing the eastern sun, nothing spectacular was expeced. the tall stone column is without any doubt the old man on the the chair in Picture 2.
the face of the old man. stone must be the thing that obscure the lip of "Short Hair Beauty". this picture. What is the detective nosing about? Some bones behind the wall? This picture is deliberately over sharpened. At the position Aa, there is a hiker. the top of a cliff. others see as an owl. What is your interpretation? something. What is he doing? Playing piano? stone columns, so are more durable than the phantom images from Fairy Land. This picture and many below were taken at Sunset Point around the sun set time. picture, there is a warrior with an animal head, carrying a long stick. picture, there sits a big fat one, either a bear or a lion. Here comes a float in a parade, with a Collie at the rear. This picture was taken the following morning at the sun rise time at Bryce Point. I call this picture "The March".